A combination of three great discovery toys! 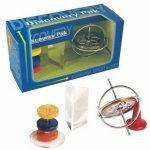 The Original TEDCO Gyroscope, Light Crystal Prism and Magna-Trix together will provide hours of fun exploring the mysteries of gravity, light and magnetism. Instructions and accessories are enclosed to discover Sir Isaac Newton's laws of gravity.